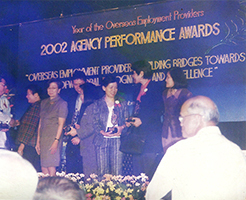 “The Founder of Avantgarde Shipping Corp., Ms. Levy G. Rebamontan seen at this photo as she recieves the "Agency Performance awards" from the POEA". AVANTGARDE is a manning agency duly licensed by the Philippine Overseas Employment Administration (POEA) to recruit Filipino crew members for all types of vessels worldwide. We have also been cited by POEA for award of excellence for four consecutive years. Today, we continue the legacy of quality service and commitment to our valued principals. During the early years, AVANTGARDE manned the NTC supertankers plying the Persian Gulf routes. This enabled the company to develop a manpower pool for tankers. From the mid 80’s, AVANTGARDE started supplying Filipino crew for various types of vessels, such as general cargo, container ships, bulk carriers, LPG’s, LNG’s and chemical tankers, VLCC’s, car carriers, reefers, research/ survey chips, anchor handling tugs, supply and fishing boats, and passenger/ cruise liners. Avantgarde Shipping Corporation (ASC) is engaged in the manning of different vessels. One of our past acquisitions that are worth mentioning was managing the Deck and Engine Department of the Royal Caribbean for almost 13 years. It led to our corporate goal of becoming one of the top manning agents of well known and respectable cruise ships in the world.